After 11 months of waiting my 6.5 Grendel parts have arrived from Alexander Arms. A while back I wanted to build an AR but could not decide on what caliber. A friend of mine is retired Special Forces and worked for DPMS after retirement. He turned me on to the 6.5 Grendel because of some testing that he did while in the Army. The more I looked the more I decided that was my caliber. I however wanted all my parts stamped with the original 6.5 Grendel designers logo, Alexander Arms. Sine I began my quest for the Holly Grendel AA has released the patent and been accepted by SAMMI. With all the gun control attempt of the past year it has taken a long time to get the parts. At one time I had even given up hope of building this AR but stuck it out. Now I am gathering the rest of the components that I decided on for this build. I can't wait to get Grenny out in the field. Some of the components I decided on are rather expensive so it will take a while longer complete but in the end it will be well worth the wait. I am leaning toward a Vortex scope and haven't decided on what free float tube and gas system I want to use. May I suggest a APUSA composite handguard. You can get one with a top rail if you want. They are light and almost 13" long which makes for a great forward hand-hold. I also had to go with an adjustable gas block for my 6.8 when I started running hotter loads. The Syrac gas block has a self-locking screw. Mine arrives tomorrow. Its going to be easier than fooling around with buffers and springs. That is a good looking free float. 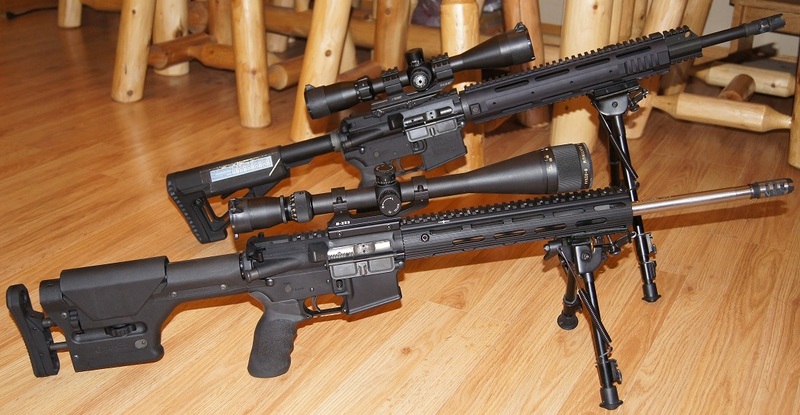 I am having a hard time deciding on which one to use because I want a lot of ventilation and stability for a bipod. And the ventilation will show off the stainless barrel. I like my hunting ARs to weight less than 6.5 pounds. This handguard helps me achieve my weight goals. I like its stability. I use a bipod on a clark's carbon handguard on my .223 long range. The Clarks is glued on the AP USA has a innovative clam-on set-up that allows me to diassemble the barrel when needed. All this for a great price. I got the rest of the small parts to completer the upper, so that is together. I put it on my 5.56 lower for a test fire today and she went bang. Now just to hit the range and start working with her. I still can't decide on what I want for optics so I threw a spare 3x9 Leuplod on it so I can start working with it. Way to go Wiersay...you are getting there mate...not long now. I like you comment...... threw a spare 3x9 Leuplod on it... I wish I could afford one mate, let alone have a spare on laying around. There are few products in life that have more variables and choices in the decision than buing a scope for ones firearm. It was late when I posted this, its not my spare leupold but rather my buddies spare. He has 3 spares rolling around in the gun room. I'm with you Vince no spares here, just hanent decided what I want on this one. a great choice of optics that is anyway. Ive finally got Leupolds on my centrefires, .22 has a 3x9x40mm nikko stirling that is even better for field of view. I finally have my 6.5 Grendel done........... well minus some expensive optics. wiersy111, beautiful!!! It was worth the wait. Does it shoot as good as it looks? 100 yards 4 shots one hole consistently. When I was Zeroing at 100 I couldn't figure out where my shots were going through a 3x9 score so I shot 4 groups of 4 and had to walk down range to see the hole. I was amazed at the accuracy with factory ammo. Now I am in the process of finding my load...... when ever it is warm enough to shoot. I need to get a cheat sheet made for the 8x32 scope I put on, I have a coyote that is pretty smart and won't come within 600 yards of the call. Get yourself a chicken and tie it to a stake. Then call the dog in just close enough that he can here the chicken. Then just wait for him to go for the bird and pop! Most coyotes have a soft spot for chickens.